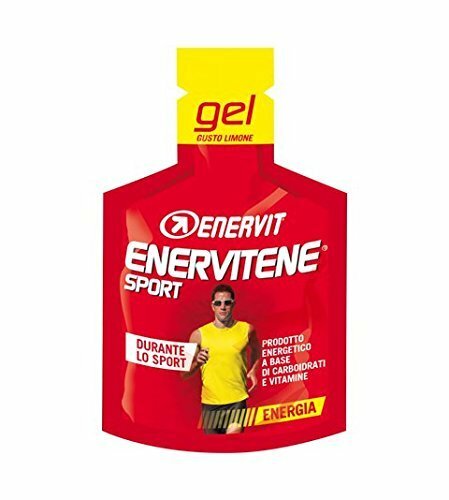 Enervit Enervitene Sport Guso Pack of lemon with 24 gels of 25ml. Enervitene is Enervit’s go-to energy source for mid-ride usage. They offer it in 3 different forms: As a drink mix for your bottles; in a pre-mixed “Cheerpack” that has a slighty syrupy consistency; and, here, it comes in Gel form. It’s reminiscent of the pudding texture of GU or Clif Shot. You should consume one gel pack for every 60 minutes of a workout, it provides you with 15. 6g of fructose for long-lasting energy and Vitamins B1, B2, and B3 for carbohydrate assimilation. Orange, Lemon or Cola flavored. Comes in a box of twenty-four (24) 25ml packets.